Time to consider ditching the chemo recliner? A cancer study published earlier this year found some very interesting results regarding the blood flow of tumors at rest versus during exercise. For some of you, it may be a surprise to learn that this had not yet been studied in animals or in humans. For me, I have been waiting for something like this for the past 2 1/2 years, since I began looking into exercise and cancer survivor research. In spite of all the cancer fundraising events where people exercise to raise money for cancer research, little is know about what all that exercise may be doing to tumors. The study (only in rats) examined prostate tumor tissue at rest and during low to moderate intensity exercise. At rest, the blood flow to prostate tumor tissue was less than that of the surrounding prostate tissue and less than that of the control animals’ prostate tissue. However, during exercise, the prostate tumor tissue blood flow increased 200%, significantly above that of the surrounding prostate tissue or that of the control animals’ prostate tissue, both of which remained the same as at rest. If you’ve ever had chemotherapy or accompanied someone who has, you may remember those nice, comfortable, recliners for resting in while the drugs pump into the veins. Well, if we could extrapolate the results of this study, resting in recliners would seem to limit blood flow into tumors at the very time that we want it to be at its maximum – while the drugs are flowing in. Now, before you get too concerned about infusion nurses yelling at chemotherapy patients to ‘push it’ for 30 more seconds on the treadmill, remember, the study used low to moderate intensity, and as I wrote previously, intensity is relative to each cancer patient’s fitness level. For many patients, I would not be surprised if strolling around the infusion ward was low to moderate intensity exercise, and for some, maybe even near maximal intensity. 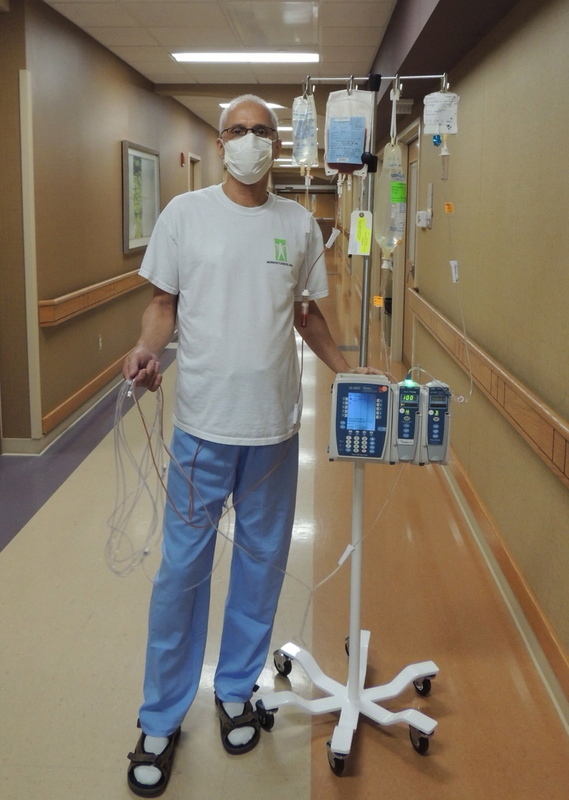 Currently, one of the best parts of chemo infusions could actually be the walking out of the infusion ward when it’s over, plus, any ‘exercise’ (shopping, walking, work/household duties) done afterwards until the chemotherapy drugs are metabolized or eliminated. They let us walk into and out of the chemotherapy infusion wards, why not walk during infusion? Some concerns may be over balance due to any sedatives administered as a part of the infusion process. True, but some sedative doses can be decreased. When I had to drive myself home after a series of infusions, they cut my Benadryl in half so that I wouldn’t be woozy for the drive home. There must be other sedatives as well that could be similarly adjusted. An editorial that accompanied the cancer study I cited above, mentioned how emerging evidence is ‘beginning to challenge the current perception of exercise as a “soft” intervention that “cannot hurt.” ‘ This is similar to what cardiology went through decades ago. Then, patients were sent home to bed rest for weeks after a heart attack. 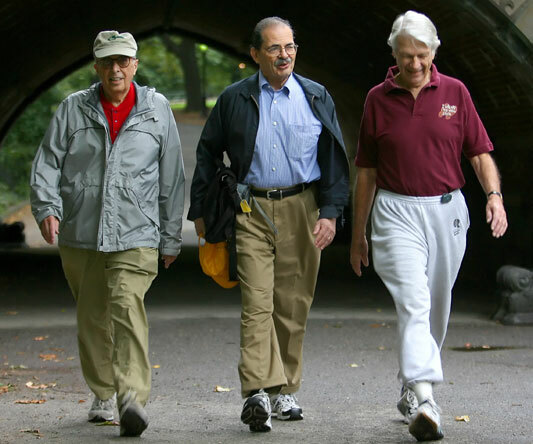 Once more research started coming in, showing that patients did better if they started exercising soon after their heart attack, cardiology started getting patients moving. This may be where we are with cancer treatments and exercise – leaving the ‘soft’ intervention realm and moving into the “A Team’ of evidence that shows improvements in existing cancer treatments. But we need human studies first. I hope you’ll help us to move evidence like this along into human studies. This is not rocket science but basic physiology, much of which has been overlooked in favor of billion dollar drug development. Fair enough, there are many effective cancer drugs, I’m not opposed to them, but can we improve the delivery of those drugs with something as simple as switching from recliners to strolling the infusion ward halls? Furthermore, what else might we discover about these physiological mechanisms that might improve cancer treatments? We will never know unless we do more research like this. Please support exercise-oncology research. This is initial evidence of a hypothesis that I’ve been advocating, that exercise ‘normalizes’ tumor blood vessels, and that this is a good thing, particularly before chemotherapy or radiation which both work better with more oxygen. This is contrary to the anti-angiogenic (choke off the blood supply of tumors) dogma that is dominant in oncology. Although, some anti-angiogenic drugs do temporarily ‘normalize’ tumor blood flow, I think exercise will be found to do it better and also with less side effects, which many of the anti-angiogenic drugs cause. Rakesh Jain at the Harvard Medical School is a pioneer in this vascular normalization area but with drug interventions. Therefore, it is encouraging to read the results from this human study that suggest that exercise may be doing the same thing. There have been some animal studies showing this but to my knowledge, this is the first one from tumors in humans. For what it is worth, my advice, and what I applied to my own treatments (including exercising during chemotherapy infusion), is to exercise before first cancer treatment (as soon as you are diagnosed, or symptomatic if experiencing a recurrence) in order to improve tumor blood flow, which in theory should improve drug perfusion or the response to radiation. This should improve treatment response rates, which I hope this study will spur many investigations on. Keep moving, even if feeling fatigued on some days. Do not let tumors gain any more advantage than they already have, influence their dysfunctional vasculature growth by normalizing it with exercise!